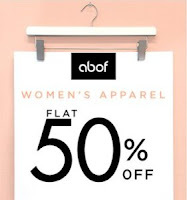 Abof- A hub of fashion accessories and Clothes owned by one of the renowned company Aditya Birla Group has come with an exciting Sale offering flat 50% off on Men’s and Women’s Clothing. Hurry up and quench your shopping thirst with our added best buy !! How to flat 50% off on Clothing ?